You are guaranteed the best price from Tom Lee Music. We continually shop our competitors, so you don’t have to. 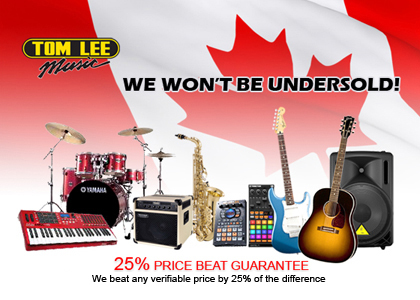 If you ever do find an identical item in stock and advertised at a lower price, including shipping, by an authorized Canadian dealer, Tom Lee Music will beat any verifiable lower price by 25% of the difference. Simply provide verification of the lower price and purchase the item from us at that price less 25% of the difference. You are guaranteed the best price from Tom Lee Music. 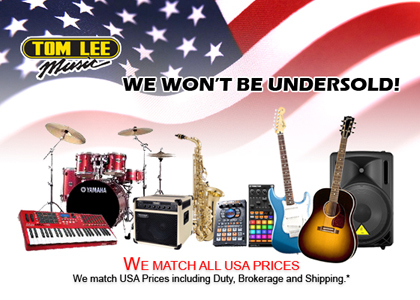 If you ever find a lower advertised internet price for an identical in stock item from an authorized USA dealer, Tom Lee Music will match any verifiable total price, including duty, brokerage and shipping charges before taxes. Plus, we include full Canadian Warranty and our legendary after sales service and support on all products. For in-store shopping, simply visit one of our retail stores and provide the dealer name and URL of the advertised price, we will verify and match the total price including duty, brokerage and shipping charges before taxes. For online shopping please go to item on the specific product page on our website and click on the "Product Inquiry" link and complete the form with the name of the dealer name and the URL of the advertised price or call 1-888-886-6533 and we will verify the total price and provide you an e-coupon for the difference for use at time of purchase. At Tom Lee Music, our goal is your ‘total’ satisfaction. We strive to provide quality products and exceptional service at guaranteed lowest prices. Your purchases are fully protected by Tom Lee Music. If at any time within 30 days of your purchase from us you find an identical item in stock and advertised at a lower price by a local authorized dealer, Tom Lee Music will fully protect you. Simply bring in a copy of the ad, even if its our own and we will gladly issue you a store credit for the difference. If for any reason you are not satisfied with your purchase, simply return the item in its original condition within 30 days of purchase and we will issue you a refund for the full amount. We are also happy to exchange the item for another of equal or greater value within 30 days of your original purchase. Returned product must be in original new resellable condition, in original packaging with manual and accessories or a minimum 15% restocking fee will apply. *No refunds or exchanges can be made on print music, opened videos, CD's, DVD's, computers, software, peripherals, harmonicas, DJ equipment, in-ear monitors or any item marked FINAL SALE on invoice. Original invoice required for refunds, exchanges or warranty. Placed in store, require a 50%, non-refundable deposit. Online special orders are paid for in full upon the completed transaction. If a return/refund of a special order item is requested, TLM will do so minus 25% of the total purchase price. Individual and unique circumstances notwitholding. Tom Lee Music carries over 60,000 items and over 800 brands in stock. Due to supplier internet restrictions not all items are available for display or sale over the internet. Please click here to view a partial list of many of the fine brands that we represent. If you have any questions about any products we carry, please Contact Us and submit your questions or requests as fully as possible and we will reply back to you within 48 hours. Please view our Website Agreement page for info relating to Terms and Conditions of use of the Tom Lee Music website. Tom Lee Music appreciates your visit to our web site. We have the utmost respect for your right to privacy and understand unequivocally, the issue of privacy as it pertains to your personal information. TLM will never voluntarily or purposely disclose any of our client’s information with any other agency, company or individual. Certain areas of our web site will ask you to provide information in order to receive a newsletter or enter a contest. When you provide us with this kind of data, it helps us better serve you, as we can then supply you with information that is relevant to your interests. You can ask to be removed from any of our newsletters or mailing lists at any time. If you wish to update or correct your information, to be removed from our mailing list (including postal) or if you have any questions about this statement, please e-mail us. Your request will be honored as it is received.